Dr. Herzog is a Wildlife Biologist at the Dixon Field Station. His expertise and interests are in quantitative analysis of ecological data with specific emphasis in avian systems and the estimation of demographic parameters. Dr. Herzog also develops statistical tools and programs used in the analysis of demography and life history. Before joining USGS, Mark was the co-Director of the Informatics Division at PRBO Conservation Science, where he led the development of quantitative techniques for the analysis of avian data and helped create the highly successful California Avian Data Center. Within his current position at USGS, Mark performs quantitative analysis of avian ecology research throughout the western United States. He has developed several technical statistical programs (primarily in the R programming language) that can be used to estimate demographic and population parameters such as survival, nest survival, nest success, and densities of avian populations. 2018 Croston, R, CA Hartman, MP Herzog, ML Casazza, and JT Ackerman. A new approach to automated incubation recess detection using temperature loggers. The Condor 120:739–750. 2018 Croston, R, JT Ackerman, MP Herzog, JD Kohl, CA Hartman, SH Peterson, CT Overton, CL Feldheim, and ML Casazza. Duck nest depredation, predator behavior, and female response using video. Journal of Wildlife Management 82(5):1014-1025. 2016 Ackerman, JT, CA Eagles-Smith, MP Herzog, CA Hartman, SH Peterson, DC Evers, AK Jackson, JE Elliott, SS Vander Pol, and CE Bryan. Avian mercury exposure and toxicological risk across western North America: a synthesis. Science of the Total Environment568:749-769. 2013 Hartman, CA, JT Ackerman, G Herring, J Isanhart, and MP Herzog. Marsh wrens as bioindicators of mercury in wetlands of Great Salt Lake: Do blood and feathers reflect site-specific exposure risk to bird reproduction? Environmental Science and Technology47:6597-6605. 2011 Nur, N, J Jahncke, MP Herzog, J Howar, KD Hyrenbach, DG Ainley, JA Wiens, LT Ballance, K Morgan, JE Zamon, D Stralberg. Where the wild things are: Predicting hotspots of seabird aggregations in the California Current System. Ecological Applications. 21:2241-2257. 2010 Stralberg, D, MP Herzog, N Nur, K Tuxen, S Siegel, and M Kelly. Predicting avian abundance within and across tidal marshes using file-scale vegetation and geomorphic metrics. Wetlands. 30: 475-487. 2009 Johnson, DH, JP Gibbs, MP Herzog, S Lor, ND Niemuth, CA Ribic, M Seamans, TL Shaffer, WG Shriver, SV Stehman, WL Thompson. A Sampling Design Framework for Monitoring Secretive Marshbirds. Waterbirds 32(2): 203-215. 2009 Stralberg, D, DL Applegate, SJ Phillips, MP Herzog, N Nur, and N Warnock. Optimizing wetland restoration and management for avian communities using a mixed integer programming approach. Biological Conservation 142(1) pp. 94-109. 2006 Sedinger J, D Ward , J Schamber, W Butler, W Eldridge, B Conant, J Voelzer, N Chelgren, MP Herzog. Effects of El Nino on distribution and reproductive performance of Black Brant. Ecology 87(1): 151-159. 2004 Herzog, MP and JS Sedinger. Dynamics of foraging behavior associated with variation in habitat and forage availability in captive black brant goslings (Branta bernicla). Auk 121(1): 210-223. 2004 Sedinger, JS, MP Herzog and DH Ward. Early environment and recruitment of black Brant (Brant bernicla nigricans) into the breeding population. Auk 121(1): 68-73. 2003 Hannam, KM, LW Oring, and MP Herzog. Impacts of salinity on growth and behavior of young American Avocets. Waterbirds 26(1): 119-125. 2003 Person, BT, MP Herzog, RW Ruess, JS Sedinger, RM Anthony, and CA Babcock. Feedback dynamics of grazing lawns: coupling vegetation change with animal growth. Oecologia 135(4): 583-592. 2001 Sedinger, JS, MP Herzog, BT Person, MT Kirk, T Obritschkewitsch, PP Martin, and BA Anderson. Large scale variation in growth of black brant goslings related to food availability. Auk 118:1088-1094. 2000 Flint, PL and MP Herzog. Breeding of Steller’s Eiders (Polysticta stelleri) on the Yukon Kuskokwim Delta, Alaska. Can. Field Nat. 113:-306-308. 1998 Sedinger, JS, MS Lindberg, BT Person, MW Eichholz, MP Herzog, PL Flint. 1998. Density dependent effects on growth, body size, and clutch size in Black Brant. Auk 115:613-620. 2018 Hartman, AC, JT Ackerman, MP Herzog, Y Wang, and C Strong. 2018. 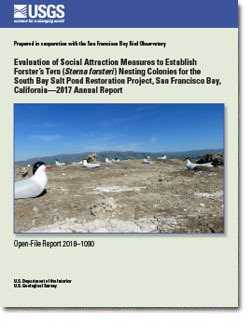 Evaluation of social attraction measures to establish Forster’s tern (Sterna forsteri) nesting colonies for the South Bay Salt Pond Restoration Project, San Francisco Bay, California—2017 annual report. U.S. Geological Survey Open-File Report 2018–1090, 25 p., https://doi.org/10.3133/ofr20181090. 2016 Ross, JRM, JA Davis, P Trowbridge, J Sun, JT Ackerman, T Adelsbach, C Eagles-Smith, A Hartman, MP Herzog, D Crane, G Brooks, C Navaroli, and L Phillips. 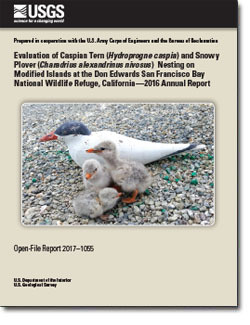 Contaminant concentrations in eggs of double-crested cormorants and Forster’s terns from San Francisco Bay: 2002-2012. San Francisco Estuary Institute, Richmond, California. 2015 Ackerman, JT, and MP Herzog. New database compiles 30 years of duck nesting data from California. August 2015. USGS Publication Brief for Resource Managers. 2009 Liu, L, J Wood, N Nur, D Stralberg, MP Herzog. California Clapper Rail (Rallus longirostris obsoletus) Population monitoring: 2005-2008. PRBO Report to California Department of Fish and Game. 2009 Herzog, MP, D Humple, J Wiens. 2009. Migratory Bird Arrivals in Indicators of Climate Change in California. Office of Environmental and Health Hazard Assessment. 2008 Burnett, R, D Jongsomjit, MP Herzog, and D Stralberg. Avian Monitoring in the Lassen and Plumas National Forests - 2007 Annual Report. PRBO Report to U.S. Forest Service. 2007 Gardali, T, KE Fehring, MP Herzog. Wild Turkey Management Surveys. 2007 Geupel, GR, WD Shuford, D Stralberg, G Ballard, D Jongsomjit, CJ Rintoul, MP Herzog, D Moody, and C Hickey. Landowner Incentive Program: California Bird Species of Special Concern in the Central Valley and Decision Support Tools. PRBO Report to California Department of Fish and Game. http://data.prbo.org/cadc2/index.php?page=predicted-bird-species-in-central-valley. 2006 Cormier, RL, JK Wood, CA Howell, T Gardali, MP Herzog, GRGeupel. Bird inventory and monitoring along the San Joaquin River: 2003-2005 Comprehensive Report. 2006 Liu, L., MP Herzog, N Nur, P Abbaspour, A Robinson, and N Warnock. San Francisco Tidal Marsh Project Annual Report: 2006. PRBO Report to California Department of Fish and Game. 2005 Liu, L, MP Herzog, N Nur, P Abbaspour, A Robinson, and N Warnock. San Francisco Tidal Marsh Project Annual Report: 2005. PRBO Report to California Department of Fish and Game. 2004 Herzog, MP, Liu L, Nur N, Spautz H, Warnock N. San Francisco Bay Tidal Marsh Annual Report: 2004. PRBO Report to California Department of Fish and Game. 2010 ModelInference. Open source package developed in R to perform model inference analyses using standard generalized linear mixed models. 2009 Ravian. Open source software package developed in R and provides core summary and analytical results for avian data. Includes code for abundance/density estimation, richnes/diversity estimation, nest survival, simple apparent survival, phenological analyses. 2009 RavianWeb. Open source software package that allows Ravian to interact within a web environment and deliver tools through the internet. 2009 nestsurvival. R package that performs logistic exposure nest survival analyses. Contains options for model selection of multiple models, and model averaging.